For residents of Phoenix, desert landscaping isn’t simply a chic alternative to more traditional landscapes; rather, it’s necessary to taking full advantage of the aesthetic possibilities the region has to offer. 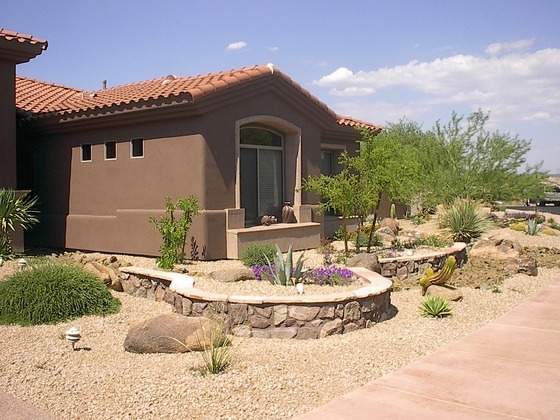 A beautiful desert landscape also offers numerous practical and even financial benefits. Landscape design artist Rick Silkey has the knowledge of local soil, vegetation, and plant life, coupled with a keen eye for aesthetics, necessary to create a landscaping plan that perfectly complements your home and your lifestyle while thriving in the Arizona climate. Who said that a beautiful yard needs to have a lawn? Especially in Arizona, lawns are expensive and difficult to maintain, demanding both precious water and equally precious time. Contrary to popular belief, it is possible to have a grassy yard, even in the desert, but that doesn't necessarily make it desirable. Incorporating native vegetation into your landscape can add both elegant splashes of color and complement hardscape elements of your outdoor living space. Purple sage, bougainvillea, bottlebrush, oleander, and orange jubilee are just some of the plants that are sun-loving, mostly or entirely drought-resistant, and in need of little to no maintenance. Of course, those homeowners who want to have grassy lawns may wish to investigate the possibility of artificial turf. Modern artificial turf looks and feels remarkably like natural grass and holds up well over time, even in the harsh desert heat. In fact, artificial grass can have a cooling effect and provides many of the benefits of real grass without requiring water. River rock dry creeks allow homeowners to create the illusion of cooling, flowing water with rocks, arranged to mimic the pattern of a small river. Augmenting these creeks with shrubs, trees, and other plants can give any yard the feel of a luxurious oasis. Larger rocks and boulders, especially those reflecting the colors of the desert, can serve as beautiful accents. Your desert landscape should reflect your lifestyle. Outdoor kitchens and bars can provide you with spaces to entertain guests on sultry evenings, while pergolas and shade structures can give you peaceful places to retreat from the heat. The important thing to remember is that your outdoor space should be a functional living space, an extension of your home. What the function of that living space should be depends entirely on you. If you would like to find out more about the benefits of desert landscaping or to schedule a consultation with Rick Silkey, please contact Prestige Landscapes today.